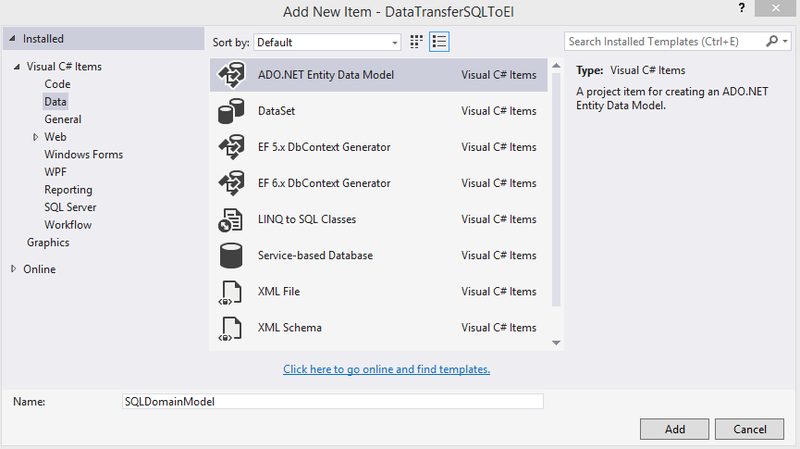 This article shows how to transfer data from a MS SQL Server 2014 to Elasticsearch. 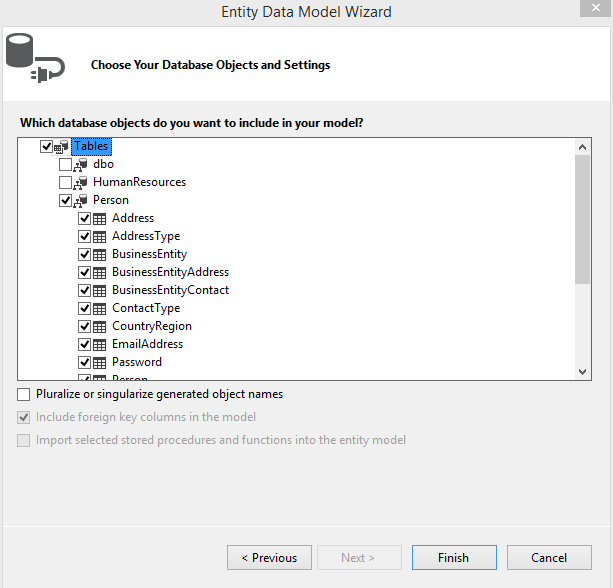 The MS SQL Server is accessed using Entity Framework (Code first from a database). Elasticsearch documents are created using ElasticsearchCRUD and inserted in bulk requests. The Entity Framework entities can be used directly in ElasticsearchCRUD. Either the whole entity including all nested entities can be saved as a single document, or just the main entity without any child objects. AdventureWorks2012 is used as the database.It can be downloaded here. You need to install the database before the code will work. Create a new console application and download ElasticsearchCRUD and Entity Framework from NuGet. Creating the code first database from the AdventureWorks database. Now select the code first from database option. The database already exists. Add all the tables from the Person schema. The Address table and the Person table will be used as the document roots. The created Address class needs to be changed. The DbGeography SpatialLocation has to be removed because this is not a supported type. In ElasticsearchCRUD V1.0.8 or later, this can be ignored using the JsonIgnore attribute. One hundred entities are selected at a time and added to the ElasticsearchCRUD context. This just adds the objects to an in memory collection. When the SaveChanges method is called, each entity is serialized to a JSON object. when all items have been serialized, a HttpClient instance sends all objects in a HTTP bulk POST request to Elasticsearch. This is repeated until all items have been transferred. ElasticsearchCRUD serializes all child elements, 1-N only. Any references to parent objects, which have already been converted are ignored and saved as a null property. The saved objects can be read as follows using ElasticsearchCRUD. This can then be used in the console application. When completed, all objects with the nested child objects are saved as documents in Elasticsearch.